Remember the good ol’ days when you saw your company on TV and that meant you are now famous and everyone knows and loves you and gives you presents? Sadly (or luckily), this is now a thing of the past. In the age of the Web 2.0 something truly exists only if it’s on the Wikipedia. Guess what? We made the cut. On this wonderful spring day we are happy to inform you that Oxwall Open Source Community Software has just reached another very important milestone in its history – we are now represented on the largest and most popular fact book on the planet. Now, before someone begins dismissing this achievement as insignificant (Wikipedia is still an anyone-can-edit project after all), consider that nowadays it is actually easier to book those 15 minutes of TV fame, than get page up about a non-profit organization. It is true that once you are the Coca-Cola of social networking, the doors in front of you open pretty much by themselves. 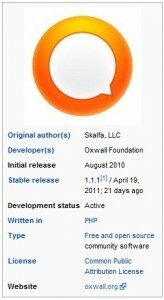 The situation changes once the doors are faced by an open-source initiative like Oxwall. You can bring joy and happiness all around you all the time, but unless Wikipedia editors recognize the entry as notable, credible and appropriate, it will be deleted every single time, labeled as ‘blatant advertising’. Leaving all that behind, the important thing is that information about an open source project like Oxwall Community Software is now also a part of the general encyclopedic knowledge. And that’s something. Continuing with our initial TV theme, Oxwall is now ready for primetime. Congratulations everyone, we are doing something right. This entry was posted in News and tagged wikipedia by Zima. Bookmark the permalink.